Monofilament thread, also known as invisible nylon, is exactly what its name says - a thread that has a single filament. Monofilament thread is semi-translucent, and it is the first choice for sewing "invisible" stitches. The Monofilament Thread Buying Guide helps customers get the right thread for their needs. 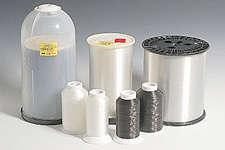 Our approach is to help you decide if monofilament thread is right for your needs, identify which sizes (thicknesses) should be used for common monofilament applications, and provide specifications for each size. Our clear and smoke monofilament thread have a semi-translucent quality that helps them to blend in with the fabric that you are sewing. This makes monofilament thread an excellent choice for blind stitching, and making exposed stitches or seams as "invisible" as possible. It is also a good alternative if you cannot find a thread color that matches your fabric. Monofilament thread looks and feels like fishing line, but it is too prone to tangling on reels. Monofilament thread goes up to 0.012 inches, whereas fishing line usually starts at 0.013 inches. For best results, use clear monofilament with light colors and smoke monofilament with dark colors. Size refers to thread thickness - not the amount of thread on a spool or canister. Our monofilament thread sizes range from almost hair thin and delicate, to thread that is strong enough for upholsery. As thickness increases, the thread's strength increases, it becomes more visible, and the yards-per-ounce decrease. Sizes 003 to 011 can be used with most home sewing machines. Size .012 normally requires a commercial machine. Monofilament sizes are usually designated in thousanths decimal inches. For example, a size .003 is 3 one thousanths of an inch. 40 Weight Embroidery Thread, 40 Weight Cotton Thread, and Maxi-Lock Sewing Thread are also Tex 27. Elongation - Monofilament thread has an average stretch of around 31% over time. This is beneficial for its end use, because it allows for the seams to stretch with the fabric, allowing for 'breaking in'. For activewear and lighter materials, Woolly Nylon thread has a greater stretch. Kevlar Thread has about a 2% stretch. Heat - Monofilament thread can usually handle continuous heat up to 285F (140C) before breaking down. Its melting point is 509F (265C). Abrasion - Monofilament thread has excellent abrasion resistance. Chemicals - Monofilament thread has good resistance to bleaches, solvents, acids, and Alkalis. Our monofilament thread is mostly sold on large canisters and smaller king spools. The standard monofilament canisters without tops (domes) are usually 5.25 inches at the base, and stand about 7.0 inches tall. The monofilament king spools average 2.50 inches at the base, and stand about 4.50 inches tall. Exceptions - In the ultra thin size .004 monofilament only, we have mini spools available that are 1.25 inches at the base, and stand about 2.25 inches tall. In size .006, we have canisters on closeout that are 6.0 inches at the base, and stand about 6.50 inches tall.